Named after the sound that bees make, Zaza Box is a delivery-only organic meal preparing newbie in G-town (Gurgaon). In a world that is increasingly getting health conscious and in a city where most jobs tend to be desk based, Zaza Box aims to get you to eat healthy and in the process stay fit. The home delivery food business has risen in the last couple of years tremendously, at least in Gurgaon. While Mumbai has always had their Dabbawallas, the highly professional lifestyle in Gurgaon has made it easier to outsource food and while the regular options like pizzas and burgers are always there, those that order out on a daily basis are always on the lookout for healthier options; and options that can relate more to “homemade” food are more than welcomed. It’s the season of startups and even though I personally hate the word, there’s no denying that a lot of young people are taking brave new steps towards new ideas and making their dreams come true in the process. 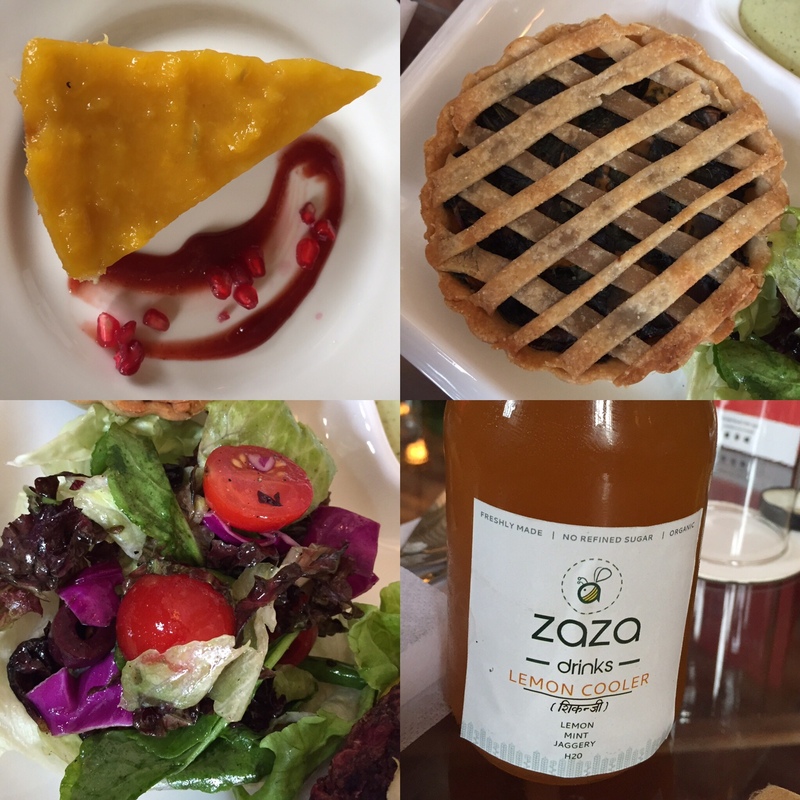 So, while I attended a tasting organized by Zomato, it was refreshing to see a young team behind Zaza Box who seemed as eager to promote their business as they were about promoting healthy, organic, and fresh eating habits. The fact that the founders of Zaza Box had more than basic knowledgeable about food, organic and otherwise, was very comforting. It’s still early days and while Gurgaon has a huge number of nuclear family, there are an equally strong number of joint families where “outside food” isn’t always an option. Moreover with the economy in an unstable state, eating outside isn’t always preferred even if the end result would benefit the consumer health wise. But, there is some hope as government taxes rise and eating out becomes expensive, a developing alternate is ordering-in which saves money and people are able to enjoy the same food at a lower cost and in the comfort of their homes. Then there are obviously the office-goers/students who might not be able to cook on a daily basis and their lunch mostly comprises of outside food. They would benefit from this the most. Zaza Box is trying hard to enter a niche market. They have the right idea and their execution seems to be good as their menu differs monthly based on seasonal fruits and vegetables. On top of that the variety of food being served is well thought of and covers both Indian and continental tastes with a bit of fusion thrown in for good measure. Take their cold pressed Beetroot and Pomegranate Juice that with its natural flavours makes you realize that the amount of added sugar in other juices is scarily high. Even though the dash of ginger they add for “zing” wasn’t enough, there is a certain freshness you can feel with each sip. The same also holds true for the Lemon Cooler “Shikanji” that attains its sweetness from jaggery and brown sugar. Again, the mint is negligible and can add a much needed punch to the drink, especially since for a regular Shikanji drinker like me the missing “masala” is a slight turn off, but then who said eating and drinking healthy was always easy. Zaza Box does, what they call, Power Snacks in addition to their daily meals. Their Glass Noodle Asian Salad looks great and l love the sound of it, but it turned out to be too hot (chili) as a result of which the freshness is lost in the overbearing spicy taste. Sadly, the same is also the case with the Veggie Sausages that are an ingenious take on other soya formulations that are found elsewhere. The use of mushrooms and tofu is minimal so the minced soy nuggets stand out, but whether it’s the spices they use or the barbecue sauce glaze on top (I think it’s the latter), the chili takes over; making what would have been one of my favourites into something I might avoid altogether. The Vietnamese Fruity Rice Paper Rolls were another looker with the fruits in all their colourful glory visible through the translucent rice paper. However, in taste, the chewiness of the rice paper didn’t go that well with the crunchiness of the fruits. Zaza Box has a vegetable alternative to this and that is something I would like to try instead. I would like to mention here that chefs, at any restaurant, should be considerable about the spiciness of their meals. Spicy doesn’t mean hot as food can be spicy without being heavy on chilies. Another point of consideration is that we are still food sharing people in India and so when food is ordered it is likely that the same will be eaten by kids and adults. Thus, this should always be at the back of everyone’s mind while experimenting with food. Chilies should be used when they add to the flavor and not just to make things “spicy”. I did however love the Tandoori Tofu Skewers which could have fooled me into believing that it was actual Paneer Tikka that I was eating. Simple and tasty, just the way food should be. The Baked Samosa too was brilliant and while the crunch from being fried was missing, the samosa wasn’t soggy, had a nice appetizing filling on the inside, and best of all, didn’t leave you with oily fingers at the end. Moving swiftly towards the mains, the Yogi Meal features North Indian preparations. The Malai Kofta lacked the sweetness that is so often found in this dish, but that’s not a bad thing. This actually made the gravy a lot more flavorsome and the koftas were nice and tender. 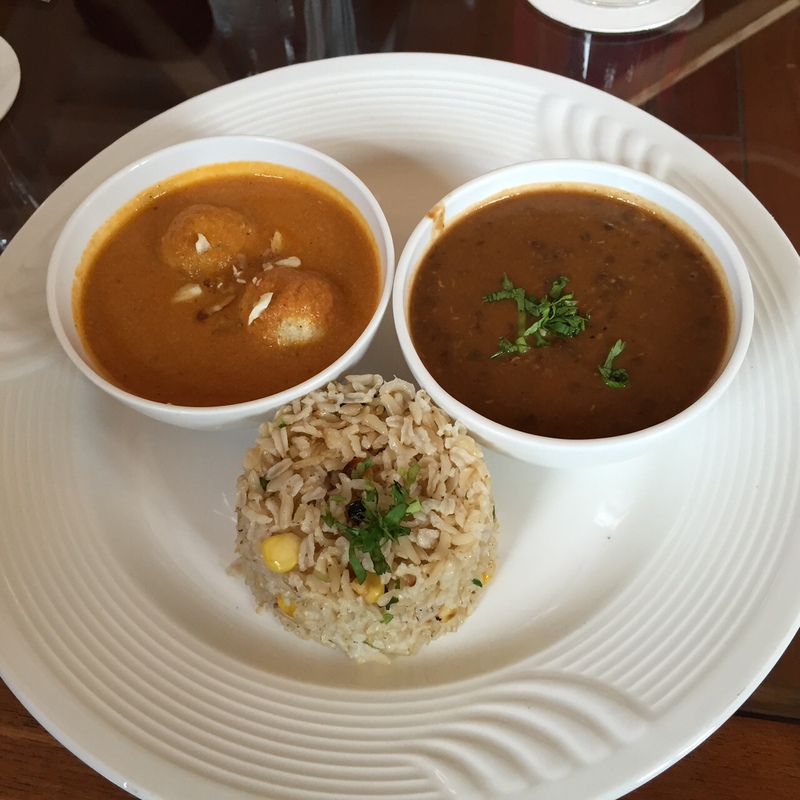 The Dal Makhani is a tough one to judge. It hadn’t dissolved to the point where it could be termed as smooth, but they did get the spices right. There is an obvious lack of cream/butter and the question arises how far should one give up on taste to be healthy. The brown rice also falls in the same bracket. It’s healthy no doubt, but this small grained puffy rice is a little chewy by nature and lacks the smoothness of the everyday white rice. It’s a battle that we as eaters and Zaza Box as makers will have to fight continuously because we desire tastes similar to what we’re used to having for decades but organic healthy eating will require some adjustments. How far one or the other will tilt is what needs to be seen. The Spinach Roti thought, that reminded me of a Thepla (without the oil), was perfect. The Travellers Meal with its Beetroot Slider (It’s actually a Burger when ordered) and Mushroom Spinach Pot Pie was something completely different. I liked the freshness of the pie, especially the aroma and flavor of the spinach, but it was a tad high on salt whether that was due to the natural saltiness of the ingredients or added salt or a combination of both, but it is something that can easily be monitored. The base though was cooked to perfection and the pie did look very homely and pretty. 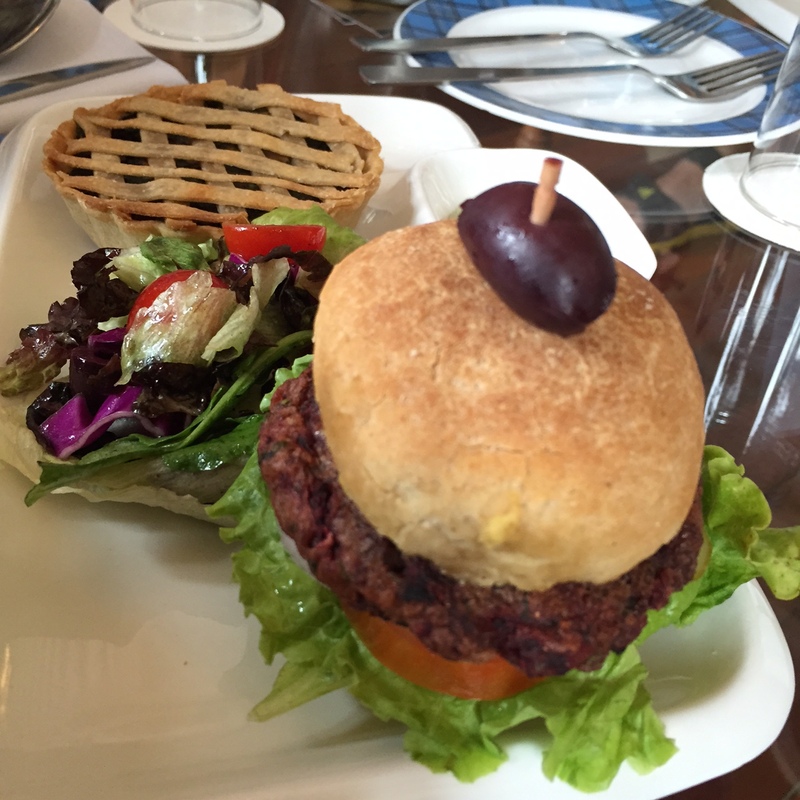 The slider was tasty and the beetroot patty had a very meaty texture to it. I was highly impressed with the side salad that consisted of a bunch of different leaves and cherry tomatoes. The colour, taste, and freshness of the salad was just wonderful. The desserts, where again we got to try two offerings, were a mixed-bag. The Mango Cheesecake had lots of fusion like flavours going for it. The biscuit base made with buckwheat and oats was especially interesting as it came close to tasting like a chocolate barfi. The smoothness of the cheese cake with the slight crunch and sweetness of the base worked perfectly in unison. Sadly the Fruit and Nut Parfait was a disappointment. The fruits and the nuts were the only saving grace that brought about some freshness and sweetness to an otherwise bland concoction that was presented nicely in a glass jar. The creaminess of the yogurt was there but it was too thick and lacked a favourable sweet flavour. Maybe a little more Jaggery needs to be added to it. Or, this can possibly be due to me having a predominantly Indian palate and the fact that I do prefer my dessert to have some sweetness to it and while the fruits tried to make up for that, they weren’t altogether successful. It might work more as a breakfast parfait, and I believe that is what they usually promote it as, but purely as a dessert, I would have liked a little more sweetness in the yogurt. To end it all, the Brownie which is cholesterol free, gluten free, and dairy free was not my cup of tea, but my kids sure did enjoy it, so maybe if they would have written this review, we’d have a completely different take on everything. Zaza Box is a nice concept that needs to keep experimenting with the flavours of their menu. I love the fact that they are not afraid to step away from the usual offerings and present dishes that include pot-pies, spaghetti-meatballs, and different types of salads. The ingredients being organic, locally sourced, and their preparations being vegan, gluten free, is an additional benefit, but it will take time to convert consumers from having food they’ve been eating for years and switch to these healthier options. Zaza Box does their part about educating the customer by sending small cards with information about the ingredients and preparations of the dishes, and that’s a nice little touch to the entire package. Their packaging is modern when it comes to the desserts in jars and drinks in glass bottles. But, the battle in the end will be won simply based on taste and in that department there is still some work required. 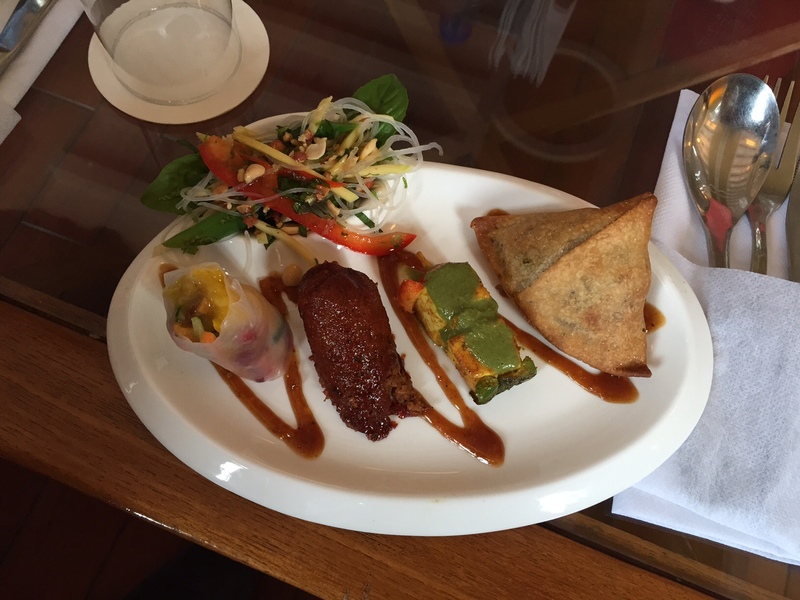 The above review is based on a tasting of Zaza Box organized by Zomato and has been written on my own accord. It’s good to know that there are healthy eating options out there beyond the usual salads and lentils. If the food tasted as well as it looks, Zaza Box seems to have a winner on their hands 🙂 There would definitely be inertia in mass movement towards healthier options, but it’s happening for sure. I think it’s a much needed change. But, because of the economy and just the general family dynamics, eating out or for that matter ordering-in isn’t always a the first priority. However, something like this would work great for the lunch working crowd and that is why they don’t do dinners as yet, but I believe they will be soon enough. Welcome to this new initiative. It’s nice to see people being adventurous and trying different things. And, more options for us consumers. Glass Noodle Asian Salad would be my favorite!! Wow, organic foods and that too delivered at home! I wish they were available in Kolkata….